← HBG: Savitri Is So Gurlie! Building a fort for them reminded me of the forts I built as a kid! the fridge and washer and dryer were delivered in HUGE boxes. No furniture yet in the living room, and that is where I built my best fort! And then their entire life revolved around examining the knots. All this came to a screaming halt when they peed in the box. 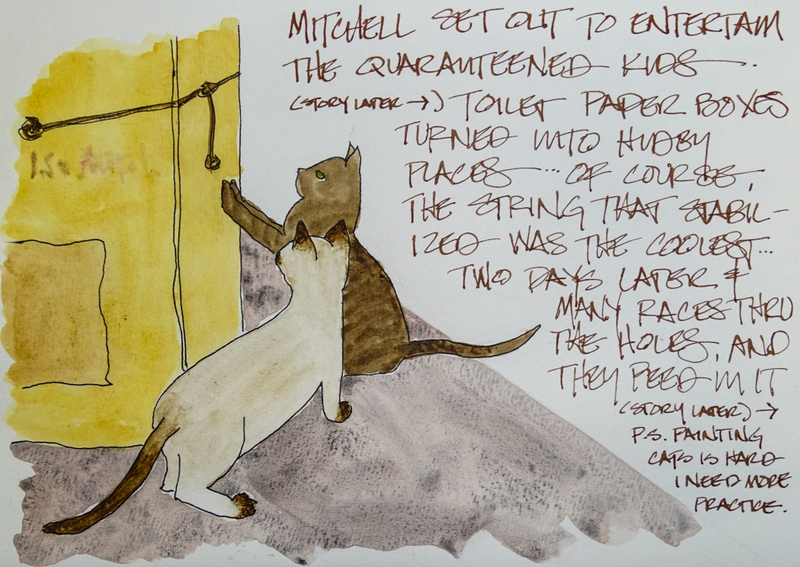 apparently, and paper trained kittens… ARGH! BTW, painting a black on black slightly striped young kitten is not easy…. Super5 Frankfurt, Noodler’s Lexington Ink, Platinum Preppie pen with De Atramentis Document Brown ink, Platinum Carbon Pen with Platinum Carbon ink waterproof cartridges, Liquid watercolors in Pentel Aquash Water Brushes. This entry was posted in animals, art journal, drawing, ink painting, journal, painting, pen & ink, sketchbook, virtual sketching, watercolor and tagged #WorldWatercolorMonth, art journal, Cat, De Atramentis Document ink, Hahnemühle Watercolour Book, kittens, Pentalic HB woodless pencil, Pentel Aquash Water Brush, Platinum Preppy pen, Savitri, siamese cats, watercolor, Yamantaka. Bookmark the permalink. Got such a kick out of reading this, Kate! So glad! They are a total delight!